Qst 1. What is the Meaning of DAQVAH? Ans: DAQVAH means Daily Quranic Verse and Hadith. Qst 2. How did DAQVAH came about? 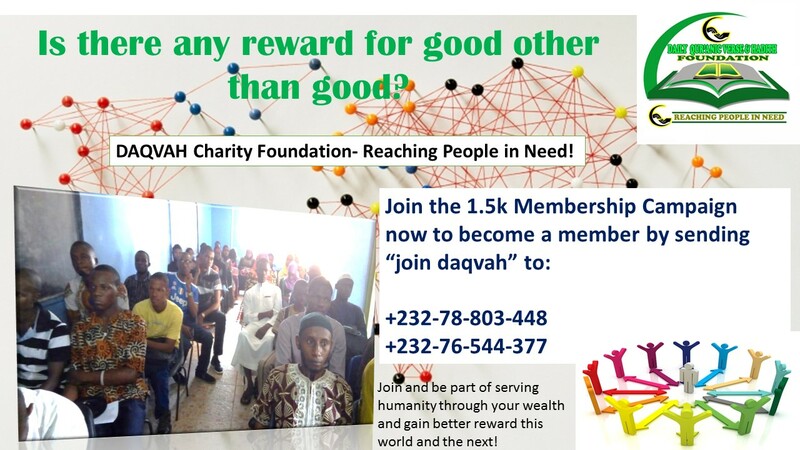 Ans: DAQVAH is an initiative that was developed by Alhaji Abdul Rahman Jalloh and wife Mariam Sedik Kamara who has the passion of helping the less privileged. Qst 3. When was the foundation founded? Ans: The foundation was founded in July 2015 at an Iftar program during Ramadan. Qst 4. Where is this foundation located? Qst 5. How can I join the foundation? Ans: Any Muslim can join the foundation via the foundation’s online registration form here. Qst 6. Do I have to subscribe an amount to become a member? Ans: Yes, all of our members are subscribing either monthly, quarterly, half a year or annually!. It is primarily with these subscriptions we implement our projects to the poor and the needy. Qst 7. Where does my subscriptions go? Ans: When you entrust us with your subscriptions and donations, we ensure that all these monies collected are used to cater for the poor and the needy by implementing different aid projects and assistance. Qst 8. When does the general membership meet? Ans: Every 3 months (quarterly) and annually, we invite all our members and anyone interested to witness our meetings where we present to our members, donors what we have done so far for the previous 3 months or year and how their monies were spent; in which way and on which projects (Financial and departmental update). Qst 9. How can I pay my subscriptions? Through our centers in Freetown. Marish Trading- 11 Lumley Street, Freetown. Qst 10. How can I know which staff is assigned to my location to receive my subscriptions? Qst 11. Do you help non Muslims as well? Ans: Yes we do, we cater for everyone in needy with no barrier in religion, race or ethnicity. Qst 12. What type of projects do you implement? Ans: Our work is purely humanitarian, we undertake different kinds of Islamic and humanitarian projects which includes; Relief Aid, Education, Water and Sanitation, Muslim Services, Medical Aid, and more. Qst 13. How are you funded? Ans: We are primarily funded through membership subscriptions and donations. We also organize fund raising event and write projects. Qst 14. What is DAQVAH team made up of? Ans: DAQVAH is made up of volunteers who sacrifice their time and efforts to ensure the foundation is successful; Currently we have 6 departments, Communications, Data and Research, Field Operations, Project, Finance and Fund Raising and Management. Qst 15. If I want to have more information, where can I go?